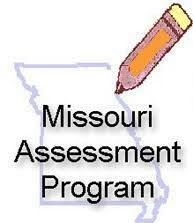 Your child will soon be participating in the Missouri Assessment Program (MAP) Grade-Level Assessments. The purpose of this letter is to provide you with general information about the assessments, and to inform you of the district's testing schedule. Please make every attempt to ensure that your child is present during anticipated testing times/dates and that he/she is prepared for testing. Selected Response (also known as multiple choice) items are composed of a question followed by a series of possible responses. Students must select the correct response or responses. Constructed Response or Short Text items require students to supply an appropriate response rather than making a selection from a list of choices. Performance Tasks/Events allow students to work through more complicated items using real-world scenarios. Technology Enhanced items make use of technology in the presentation of the item, the ways in which students respond, or both. For example, students might watch a video and then drag and drop labels into a diagram, or click on specific parts of a text to provide a response. After testing, your child will receive an Individual Student Report that will give you information about his or her achievement in terms of the content and skills assessed by the MAP Grade-Level Assessment at his or her grade level. Your child's Individual Student Report will include an Achievement Level, which will describe his or her performance for the grade level and content area as Below Basic, Basic, Proficient, or Advanced. The report will also include a short description of the knowledge and skills that are typically demonstrated by students in each Achievement Level for that grade level and content area. You will receive this report when your child returns to school next Fall.